Please note downloads are only suitable for computers, to download direct to mobile phones or tablets please visit Itunes where all our albums are available. Thank you! Bhavana’s new kirtan album is a wonderful collaboration of Narayani’s evocative melodies and Mat’s colourful instrumentation and rhythms joined by Cello, Double Bass, Bansuri Flute and Violin. A dynamic album of mantra, meditative to uplifting chants, that will take you on a powerful journey. 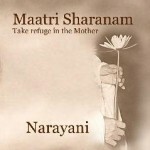 Maatri Sharanam (Take Refuge in the Mother), is a collection of traditional Sanskrit chants set to a range of beautiful melodies composed by Narayani. Mixing slow, gentle tempos with upbeat folk-style harmonies, and accompanied by tabla (Indian drums) and violin, Narayani’s powerful chanting is at once spiritually uplifting and profoundly meditative. And, whilst honouring the Indian tradition and philosophy of Kirtan (call and response chanting), her compositions have a western influence with wide appeal. A beautiful soulful album of devotional folk music. 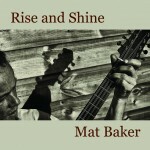 Mat combines stunning bouzouki playing and percussion with his gentle but soulful lyrics. This is a meditative album with a deeply relaxing quality. 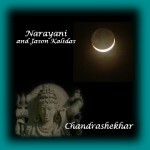 Narayani’s first album including chants such as Om Namo Narayanaya and Jai Ananda Mayi Ma. 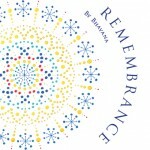 This inspirational work combines both meditative and ecstatic chants. Narayani’s resonant and powerful voice is supported by dynamic tabla rhythms and soulful Raagas on the Bansuri Flute. This album was created in collaboration with Jason Kalidas.